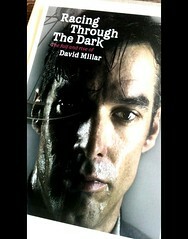 David Millar’s memoir Racing Through The Dark serves as the long-overdue confessional for an entire generation of bike racers. His downward tumbles — from amateur powerhouse to exhausted neo-pro; from determined reliance on his own physiology for recovery to the use of injections; from injections to full-blown dopage — are not portrayed as a morality play. Rather, as David Walsh laid out about Motorola in the late 90’s in his (now-vindicated?) book From Lance to Landis, succumbing to EPO was, for many, surrendering to an inevitable exhaustion of resolve and body. Yes, there was a choice: Don’t dope and don’t race. But for the boys who gave their all from 1996-2005, the calculated consumption of drugs became an absolute requirement. Racing Through The Dark is the first autobiographical account of the dark emotional calculus that surrounded the use of drugs in the professional peloton. For Millar, nothing summarizes what it means to be a professional more than the million subtleties encapsulated in the word preparation. For countless many in his generation, using EPO was to be prepared. A lack of preparation would represent a lack of professional pride — which, for most, was a thing far worse than the self-loathing that came from the use of drugs. ‘In my youthful exuberance, I was telling anybody who would listen that I’d won [the time trial stage of the 1998] De Panne and broken the course record with a hematocrit of only 40 percent. I went to see [Francesco] Casagrande…so I could show [him] my results. ‘Perché non e a 50?’ Casagrande asked, puzzled. 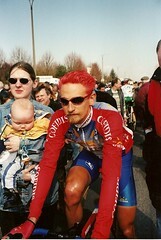 The book reaches a crescendo in Millar’s final years with Cofidis when his professional conscience (i.e. being ‘prepared’) muted any remnants of a personal conscience. His palmares made him the savior for his team, its management, and justified Cofidis’ considerable investment in cycling. Beyond this, he was perhaps too fond of his supersized celebrity in Biarritz — a seaside resort for the rich and famous. Although he is British, Millar had become a golden child of French cycling as a whole. He lived and trained in France, rode for a French team, and put a single-minded priority on the Tour de France. ‘As I took it all in, something shifted in me. I was being asked [by a Cofidis team director] to go to Italy to take EPO. I would then go and win the Vuelta prologue, thus redeeming the team with the sponsor. It boiled down to professionalism. I was weary — too weary to fight any more. All that resistance — all that fighting I’d been doing, all that idealism that at first came so naturally and had slowly grown into a futile and isolating stance — was now behind me. I had done well — bloody well — as a clean rider. I had stood my ground, done my bit, but now it was out of my hands. The team needed me to accept my obligations, and now it made sense. The tired young dreamer had been waiting for this moment. The background white noise of the struggle to fight doping finally subsided. I opened my mind and let it in. In his transformation from ingénue to cold-blooded user, there was an enabler, of course. He’s the most interesting character in the book. Millar only refers to him as l’Equipier, thanks to his lawyers, no doubt. Speculation on the identity of l’Equipier will doubtlessly become public sport in the next few weeks. Although Millar never gives his name, he provides enough specific contexts of races and dates that 60 seconds of Google time easily reveals his identity. From the book it’s apparent that he’s a veteran Italian domestique. In case you held out any hope that doping wasn’t institutionalized on a team level — particularly in France a half-decade after the Festina scandal — the presence of l’Equipier will vanquish that notion. Millar renders him darkly, with his villainy made clear early on by the compliments he gave Millar as a neo-pro. Once congratulating him, for example, because his mid-pack finish in an early season race made him the first clean pro across the line. Other chapters are remarkable as standalone short articles. Millar was a young pro on Cofidis at the same time his teammate Frank Vandenbroucke reached his professional peak. His description of VdB’s (and Phillipe Gaumont’s) monstrous appetite for Stillnox (a different name for Ambien) and Champagne is frightful. For all of the legend of VdB’s iron-fisted dominance at the 1999 Liege-Bastogne-Liege, who knew that he downed eleven sleeping pills the night before? The happiest surprise of the book is Millar’s story of falling in love with the bicycle while bridging his time between England and Hong Kong during his youth. It’s arguably the finest rendering in cycling literature of devouring training as a teenager. For those of us who had the same experience, it’s a welcome remembrance of that beautiful spell of feeling alive. The book is not without imperfections. You can feel the pressure of what must have been a publisher’s deadline as he accounts for his professional marriage to Jonathan Vaughters and the Slipstream program. Compared to the first two-thirds of the book, the prose here feels rushed. And unlike the private, less-exposed days Millar spent with Cofidis, Slipstream has long been a team defined by its overwhelming PR. There’s a familiarity to the current phase of Millar’s career and to Slipstream’s ethical mission. His role as outspoken anti-doping ambassador is an endpoint most of us already know and don’t require a lengthy refresher on. Racing Through The Dark is transparent, yet unburdened by retrospective apology. It explains the clear-headed rationale of what once was through gripping prose. It’s also testimony to the pleasures of reading about an era prior the invasion of social media, when our racing heroes were cloaked in so much mystery. Nowadays, Twitter and Facebook make it seem as though we share breakfast with the pros every day. To have the curtain drawn back on an older world — one rife with dark unknowns — is a reminder of what a well-done memoir has the power to reveal.